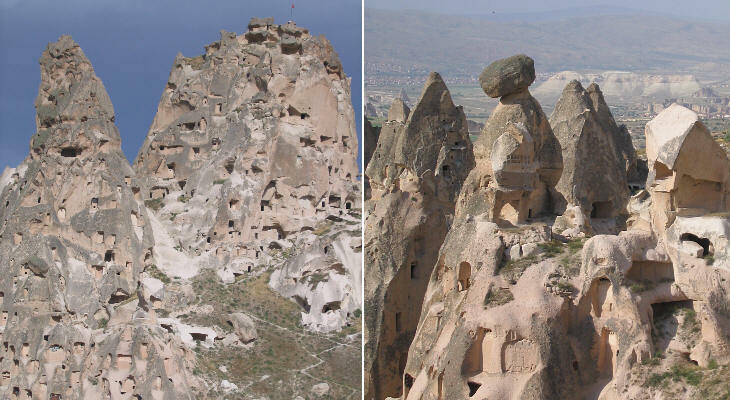 Uçhisar means "third castle", but because in Turkish uçus means flight and uçmak means to fly, one could think that "flying castle" would be a more appropriate name for this rock which stands above Goreme and can be seen from a very long distance. 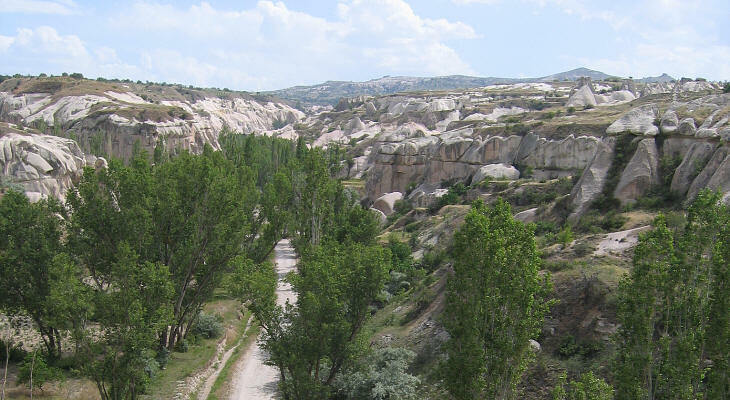 While the erosion process which occurs at the edge of the tableland is easily understandable, that which led to the formation of Uçhisar is not. It is difficult to understand why volcanic eruptions accumulated so much ash at this location. 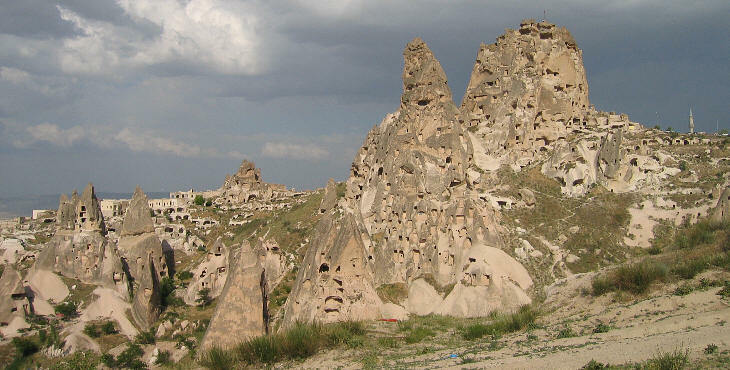 Uçhisar is located in a dominant position on the southern edge of the valley leading to Goreme. The inhabitants were relocated some decades ago from their rock-cut homes to new houses. Authorities have not allowed the construction of exceedingly large buildings. The way the rock has been carved out is simply unbelievable; inside the main peak there is a covered road leading to its top: it was the village high street. Occasionally the block of basalt which limits the erosion of the underlying tuff holds its position even though physics laws would expect it to fall. 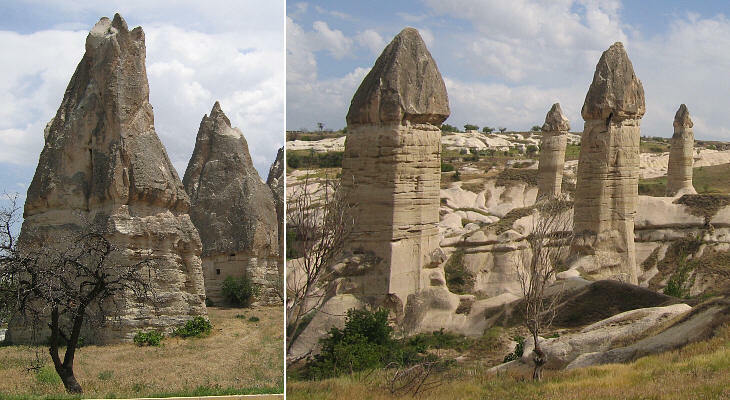 These pinnacles with a sort of Basque cap are called fairy chimneys. 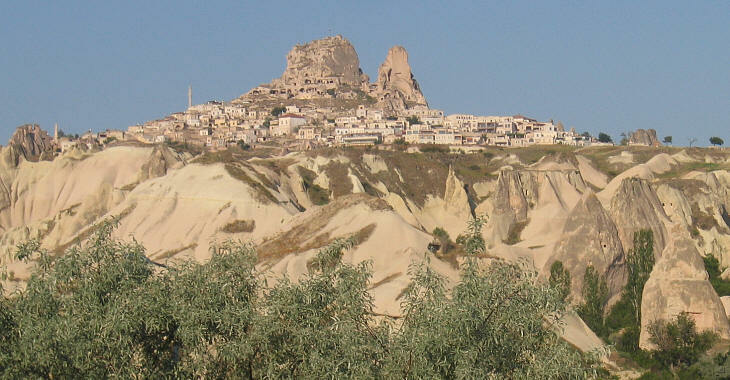 Uçhisar is an excellent starting point for going down to Goreme along one of many paths (locally called valleys; as you may expect there is a Love Valley). High poplars and tiny carefully farmed fields flank the paths. The shape of the rocks follows a generic scheme but with many variations.